The Legend of Zelda: Breath of the Wild is still enchanting Nintendo Switch players with its mesmerizing exploration and classic dungeon-delving goodness, and the fun isn't set to stop anytime soon. Nintendo took some time during their E3 2017 Treehouse spotlight to showcase some of the game's upcoming DLC, including the first solid details regarding what players can expect from the Champion's Ballad DLC pack. What's Included In The Champion's Ballad DLC? The Champion's Ballad DLC for The Legend of Zelda: Breath of the Wild is set to include the first-ever story-based expansion to a Legend of Zelda game. With it, players can expect to find a series of new challenges as well as an additional dungeon that coincides with new original story content. It's unclear as to whether or not the Champion's Ballad DLC is a prequel to the events of Breath of the Wild, but players can expect to see story elements featuring Mipha, Urbosa, Revali, and Daruk. 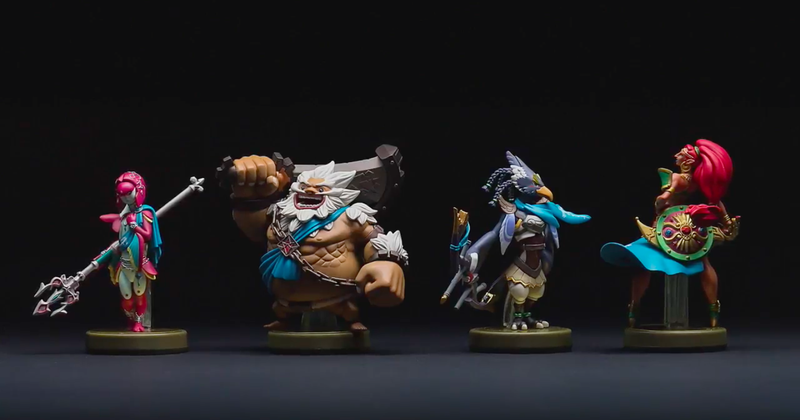 These champions will also show up as amiibo sometime around the holiday season. For a full look at what Nintendo has revealed for the Champion's Ballad DLC, check out the video at the top of this story — the new content starts around the 2:12 mark. Just be forewarned: the video may spoil some content for players who haven't yet finished the game. When Will The Breath of the Wild Champions Ballad DLC Release? How Much Will It Cost? While no specific date has been given, Nintendo is aiming to release the Legend of Zelda: Breath of the Wild Champion's Ballad DLC sometime during the Holiday 2017 season. Additionally, there's no option for players to buy the Champion's Ballad DLC a-la-carte; instead, players must purchase the entire Breath of the Wild Expansion Pass, which is priced at $19.99. What Else Is Included With The Breath of the Wild Expansion Pass? There's more than just the Champion's Ballad DLC in the works for The Legend of Zelda: Breath of the Wild. Nintendo have already revealed what's in the first batch of DLC dropping with the Expansion Pass, and it's set to include the new Trial of the Sword challenge, a new Hard gameplay mode, and the new Hero's Path mode. This batch of DLC also includes additional armor and items, and is set to release on June 30. For a full breakdown of what's bundled in with the first DLC drop, check out our Breath of the Wild DLC guide. Also, as a nice bonus, any Wii U or Nintendo Switch players who purchase the Breath of the Wild Expansion Pass will find that three treasure chests have spawned in the Great Plateau area. Two of those chests will include various useful items, while the third will contain a special Nintendo Switch t-shirt for the Hero of Time to sport on his adventures. Neat! Fans of The Legend of Zelda are spoiled for choice when it comes to carrying cases for their Nintendo systems, as there are great Zelda-themed cases featured on our list of the Best Nintendo 3DS Cases as well as our list of the Best Nintendo Switch Cases.